During the winter of 1944–45, the western allies desperately sought a strategy that would lead to Germany’s quick defeat. Hundreds of thousands of soldiers in trenches and dugouts suffered through the bitterest European winter in fifty years. The Allied high command decided that First Canadian Army would launch the pivotal offensive to win the war—an attack against the Rhineland, an area of Germany on the west bank of the Rhine. Winning this land would give them a launching point for crossing the river and driving into Germany’s heartland. But before the Allies could strike, Hitler launched a massive offensive towards Antwerp, the Battle of the Bulge. By the time the Germans were driven back to their start lines, the first thaws had begun. Previously frozen ground, ideal for mobile warfare, had turned to quagmire. Anticipating the Allied attack, the Germans broke dams and dykes to inundate great swaths of the Rhine’s floodplain. 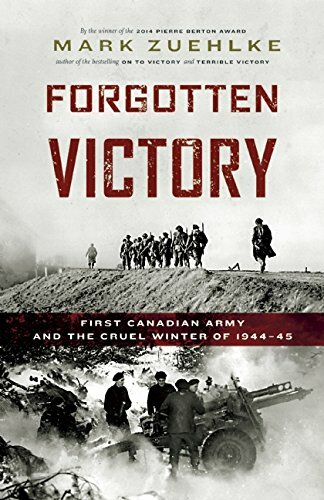 On February 8, 1945, First Canadian Army launched Operation Veritable. Advancing on the heels of the greatest artillery bombardment yet fired by the western Allies, thousands of Canadian and British troops advanced into an inferno of battle under orders to surrender not an inch of German soil. Infantrymen were forced to fight relentlessly, with little support and often in close quarters, for thirty-eight gruelling and costly days. Infantrymen of the 7th Canadian Infantry Brigade and a German prisoner in a Universal Carrier, Authie, France, 9 July 1944.